We’d lit the candles, eaten a sumptuous meal including latkes, chicken (for the birdievores among us), a spicy bean stew, shepherd’s pie, crisply cooked green beans, and the usual assortment of desserts. 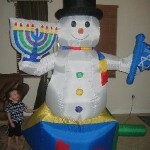 We’d sung Ma’oz Tzur, S’vivon, and other Hanukkah songs. A variety of congregants delivered jokes, stories, poetry, puns, and song during dinner. Afterwards, we all collaborated on a cool craft project whose final outcome will be seen at the next Shabbat service, I am told. I gave each table a minyan of questions. They were to work as a group. I wandered about listening and observing as everyone got to work. But I didn’t get too close. Otherwise people feel they have to check in with rabbinic authority, and I prefer the etz chayyim hi model, where they do their level best to find out just how much they know and how much fun they can have on their own. Jewish practice should feel like blowing soap bubbles: Start the breath flowing and all sorts of magic will sparkle before your eyes – and heart. One table repeatedly burst into collective laughter, another remained steadfastly serious, and yet another featured individuals experiencing excited “yes” moments evidenced by jumping up and down in their seats. (This is not an easy thing to manage.) After about fifteen minutes, we gathered up the answers, a representative of each table read their answers, and the entire group was asked to declare the winning table. The steadfastly serious table repeatedly demonstrated comprehensive knowledge of the holiday by answering all questions directly and correctly. 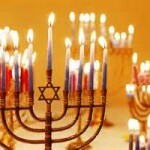 Yes, Hanukkah means “dedication.” No, Hanukkah is not mentioned in Torah. Yes, it is the shammash candle that is used to light the others. The table of boisterous laughter proved they had a command of the material. 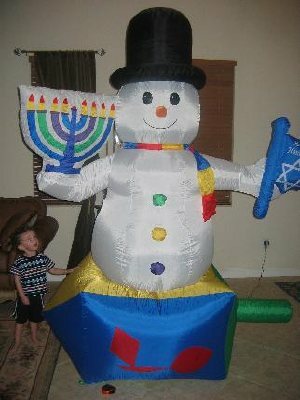 They added definitions for “Hanukkah,” indicating that one might associate education, rest, and even grace with the term, depending on how you parse its letters. One member of the seriously-minded table immediately accused this group of being nes-sayers. But the song deserved what it got: Much in the way of appreciative applause by the under-fifty crowd. Some over-fifties seem not to have gotten the joke. We may be one of the smallest communities out there in the Southeast. But I would wager we are among the cutest. At the end of the evening, we exchanged our white-elephant presents and took a few moments for a group blessing. But really, we had already blessed one another – with good will and with humor, with joy and with laughter. 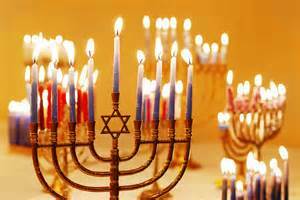 May you all experience the same: Hag sameach, and may your last night of Hanukkah be filled with joy and light and all good things.